Director and screenplay writer Alfonso Cuarón tells a very personal story of growing up in the 70s in Colonia Roma, Mexico. Roma a story of home, love, hope, courage, and change is female-focused, providing emotional, soul-searching portraits. In capturing the monotonous tasks of his beloved housekeeper/caregiver, we are privy to quiet colorless moments that demand to shine as brightly as a rainbow. 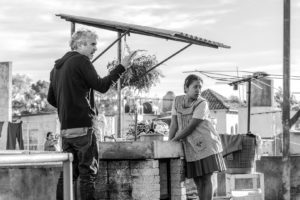 Roma, is nothing short of an artful masterpiece — providing a snapshot of a time in the past, which demands reflection of a position that is often left in the background, while simultaneously viewing the plight of a single mother’s immense obstacles that have become the norm. In starting our interview I thanked Cuarón for taking time out of his busy schedule to speak with me, as he had just won awards for Best Director of a Motion Picture, Best Motion Picture, and Best Screenplay of a Motion Picture at the Golden Globes two days prior. Sarah Knight Adamson: I believe your film generates “empathy” which is what Roger Ebert feels is the heart of cinema. Can you speak to that point in terms of Roma? Alfonso Cuaron: Yes, that’s the beauty of cinema and the beauty of the diversity of cinema as well. In a world in which we have to build walls, and not only the physical walls, the walls of rhetoric of hate going up right now, there are more subtle walls, some invisible walls, those walls we create between social classes and ethnic groups; and cinema can open a window to those walls by immersing us in the experience of other people. At first it seems so strange, and we start to understand more by the familiarity, I think cinema is the perfect avenue by what Ebert calls a machine for empathy. SKA: In your personal film, I was wondering how the abandonment of the men in both Cleo and Sofía’s life affected you both as a child and later as an adult? AC: Those were the circumstances of my life. The abandonment of a male father figure, and the pain of his lack of regret, he was just like, ok, that’s it, I’m done. And then the same thing happened to Cleo. This created a struggle for both women. My mother became a single mother and had to change jobs to try to support the family, with Cleo, the whole idea and a dream of a life was crushed, and ultimately for the children, it’s a big scar, and it’s a big trauma. I was very lucky to counterbalance that situation, I had a big lack of a father, but I had the presence of two amazing women as mother figures, so I’m blessed by that, however, by this I don’t think it justifies nor ethically or just emotionally, that absence of a father figure. SKA: What was your favorite scene to film? AC: This is a very complex film; I was exploring my past, shooting in the places where my life took place many years ago, reproducing by the inch those spaces, with actors that were the look-alikes of the original people and dressed like they were. In reproducing those moments it was very complex, and it was very, very pleasant, in an intense way, I was completely passionate about this film as things were unfolding, I was diving into the unknown, the way that I did this film was unlike any film I’ve ever done before, so I was constantly curious, but at the same time in a constant state of alert.